New York City is the world’s top destination for pickup basketball. Thanks to storied courts like The Cage at W 4th and Rucker Park, NYC playgrounds are legendary among lovers of the sport and New Yorkers alike. But more striking than the popularity of basketball is the sheer quantity of courts throughout the city’s neighborhoods, and the public effort they require to maintain. Using data from the NYC Parks website and NYC OpenData, I combined several datasets to learn about the layout of NYC’s basketball courts and how the city manages and records public planning for each park. 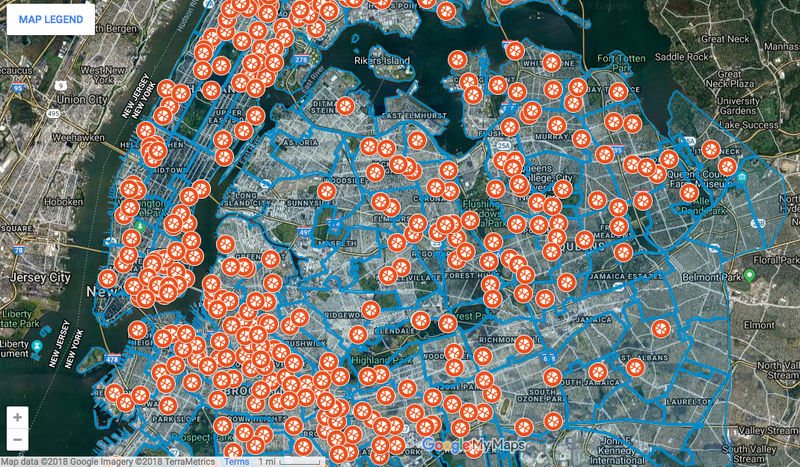 First, I created a map charting each one of the city’s 541 basketball courts to its corresponding neighborhood. This map can be a useful companion for newcomers searching for a nearby court, or for making a plan-B to avoid an overcrowded playground or sub-par competition. The map also displays the concentration of courts in each neighborhood, making it easy to identify the city’s top basketball neighborhoods. Below is a table displaying the concentration of courts with demographic data for each neighborhood tabulation area (See Appendix for a more in depth analysis of basketball neighborhood demographics). CPI Zones are neighborhoods identified by the NYC Parks Department as “densely populated and growing neighborhoods where there are higher-than-average concentrations of poverty.” Almost all of the top basketball neighborhoods are designated as CPI Zones, including the most popular basketball blocs, like the Lower East Side-China Town-East Village, North Harlem-Polo Grounds, and the string of Brooklyn neighborhoods running from Bedford to Brownsville. From 1992–2013, the parks in these neighborhoods received less than $250,000 in funding. In 2014, however the NYC Parks Department committed “capital investment and improvements, enhanced programming, and public outreach efforts…” to support these neighborhoods and their parks. When is your court getting fixed?! The top basketball neighborhoods in our list are classified as CPI Zones and therefore are expected to benefit from capital improvements programs in the near future. But, what’s going on with your local court(s)? Tools like the Capital Project Tracker, used by the NYC Parks Department to record its progress, is helpful for checking on updates for upcoming and past improvement programs. 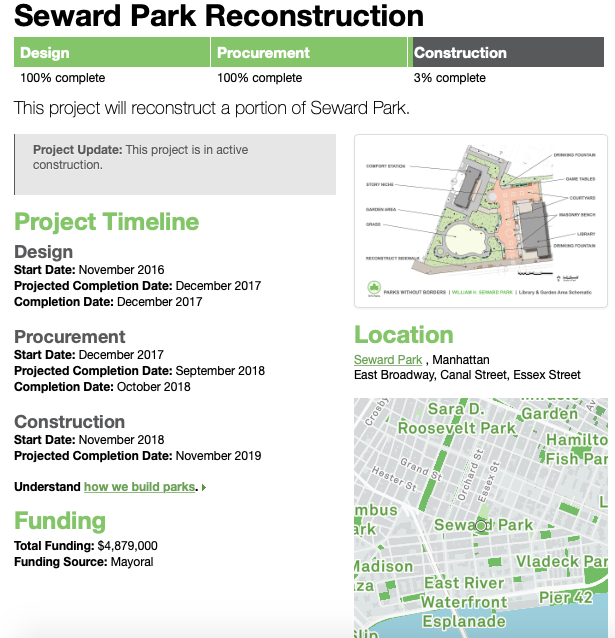 For reference, check out the landing page for Seward Park on the Lower East Side — one of the basketball courts included in our data. Here, you can review plans for capital improvement, funding, and future designs, as well contact information for the project liaison on staff in case you want to raise specific concerns regarding the court and its improvement plan. These tools provide a high degree of accountability and transparency and make it simple to learn a lot about the public projects relevant to you and your community. Below is a list of the datasets used for the basketball court map and the demographics charts. Neighborhoods with many basketball courts tend to have outsized minority populations. This gap is especially noticeable in Manhattan where African American and White populations diverge in neighborhoods with and without many basketball courts. *”Many basketball courts” refers to neighborhoods in the top 75th percentile of court count, while “few basketball courts” refers to neighborhoods below the 25th percentile of court count. 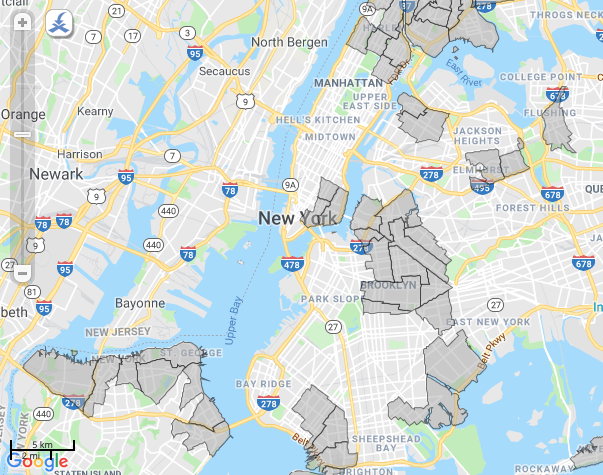 The discrepancy is largest in neighborhoods with few basketball courts — a set that includes neighborhoods like the Upper East Side-Carnegie Hill and Battery Park-Lower Manhattan. Here, the African American population is less than 3/4ths of its overall representation in Manahattan.